A small, lightweight self-inking date stamp, which easily fits in your pocket. Ideal for on the move! With a circular impression of 19 mm, you can include a maximum of 2 lines of personalised text alongside the printed date. Practical idea: the 46119 is most suitable as security or entrance stamp for large events or concerts. The date is 2,8 mm high and prints day, month and 12 consecutive years in figures. The stamp is only available with a red casing. The suitable ink pads 6/46019 are available in black, blue, red, green and violet. Dry felt pads are suitable for special inks. 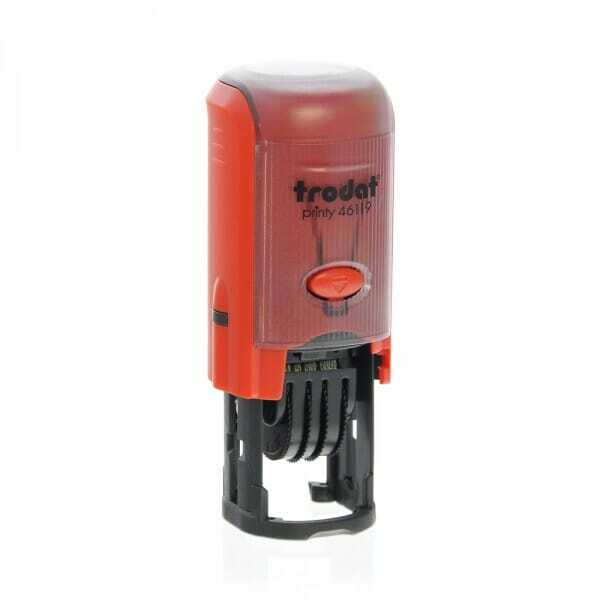 Customer evaluation for "Trodat Printy Dater 46119 19 mm diam. - 1+1 line"